Need a stocking stuffer for your iDevice user? “I recently found ‘Tech Touch’ gloves available at Target with which work with iPad or capacitance touch screen. The gloves prevent inadvertent touches from the palm or other finger. The touch is limited in the thumb and index finger. It allows the user to rest the hand on the touch screen without activation. It would work much less intrusively than a traditional keyguard. 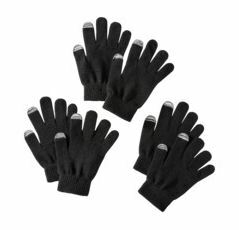 The gloves fit most hands and relatively inexpensive (3 pair for $9.99). You can also find these Tech Touch gloves in assorted colors from Targets online store for 3 for 9.99 (with free shipping on purchases over $50). Nice find and great iDevice accessory Chris! Thank you for sharing! This entry was posted in Accessibility, Accessories, Holiday and Special Events, iPad, iPhone, iPod, iPod/iPad Accessory, Occupational Therapy and tagged Accessibility, accessories, iPad, iPad accessories, iPhone, iPod, occupational therapy. Bookmark the permalink. 2 Responses to Need a stocking stuffer for your iDevice user? Yes I also love these!!! They are great for any mobile device!!!! Chris found a great deal!